Blood type. January. 23, 2019 07:48. .
People often compare life to four seasons as they resemble our journey of life. Buds bloom in spring, everywhere is green in summer, trees bear fruit in fall, and all things freeze in winter. Some people die before completing that journey of life. 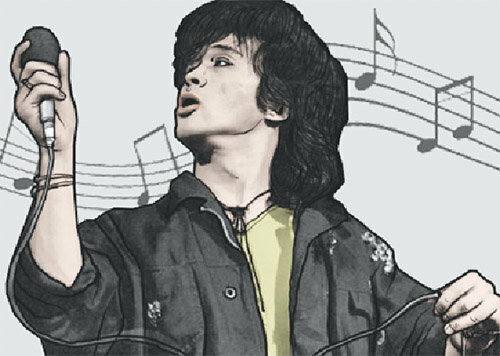 One of them is Viktor Tsoi, Russian singer who was born to a Korean father and a Ukraine mother. He died at the age of 28 in 1990. He forever lives in summer like the movie “Leto (summer in Russian),” which depicts the youth of Viktor Tsoi. There is a wall in Moscow dedicated to Tsoi and people still sing his songs. His songs were the fruit of subtle tension. There was an oppressive totalitarianism that put a gag on rock music, Western culture, on the one side and spirit of liberalism represented by rock music on the other side. There was a clash between the two in his music, which was so soft and lyrical like the songs of the Beatles. The case in point was “Blood Type,” one of the best of his songs. The song was about soldiers being sent to the Afghanistan War (1979-1989). “On the sleeves is my blood type/On the sleeves is my military service number/Wish me luck in a battle.” It sounds like the words of a brave soldier going into the battlefield but the tone suddenly changes. “Although I’ll have to count the cost/ I don’t want to win at all cost/ I don’t want to trample over somebody.” The title “Blood Type” is also significant in that soldiers have their blood type stamped onto their serial number chain in case they need to receive a transfusion. It means a war can cost someone’s life. There is a very clear anti-war message in the song. When the song was released, the Soviet Union was in a war in Afghanistan for nine years. The lives of young people were being wasted. Young people, who were disenchanted with totalitarianism, were fascinated by the song. The song comforted them and gave them power to live. But Viktor Tsoi suddenly died in the Leto of his life.